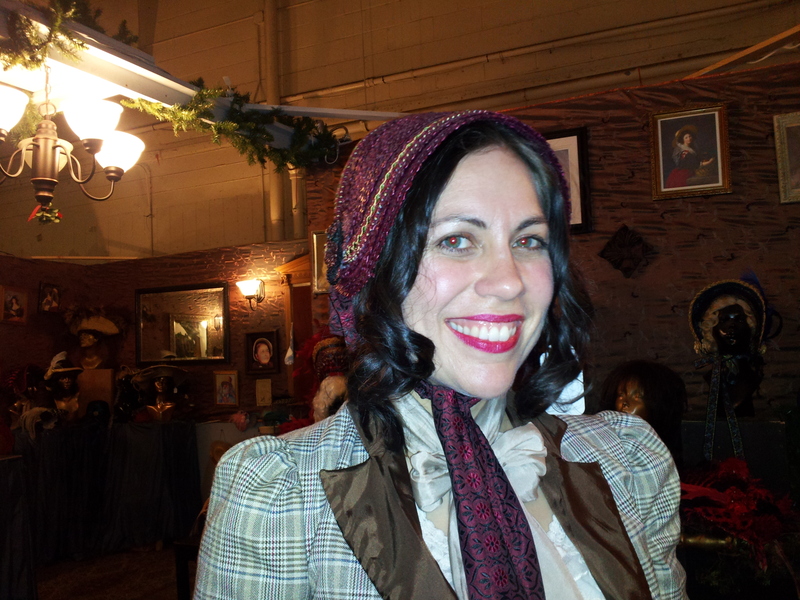 My friend Bethany and I went to Dickens Fair which is held every year in Daly City, just south of San Francisco. I have known about Dickens for a number of years but never went- even when I lived here. It’s a crime, I know. It’s so much fun! We had tea together before walking around and enjoying the shows, the shops and a lot of people watching! 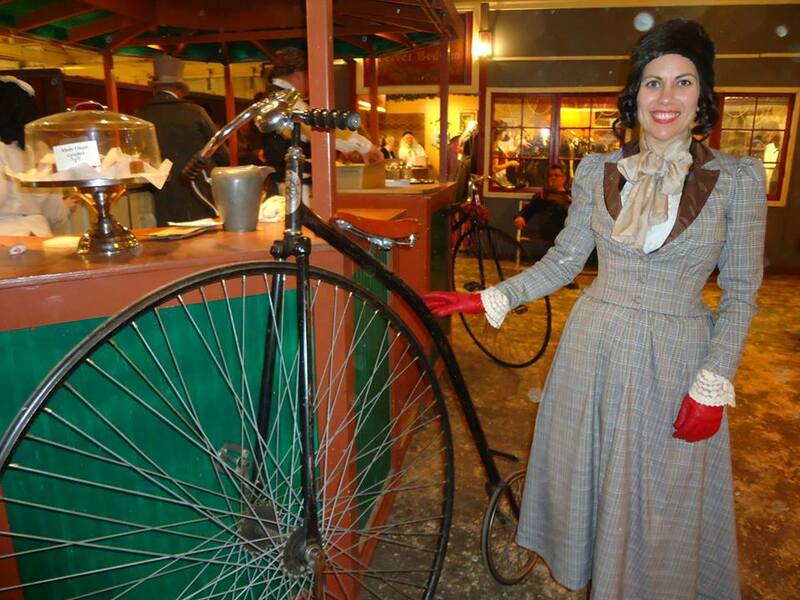 I even met up with an online friend I made during the 1912 Project! Lisa, pictured below, runs a blog with Robin, who I met but forgot to get a picture with! We walked around, talking with Lisa for a while. 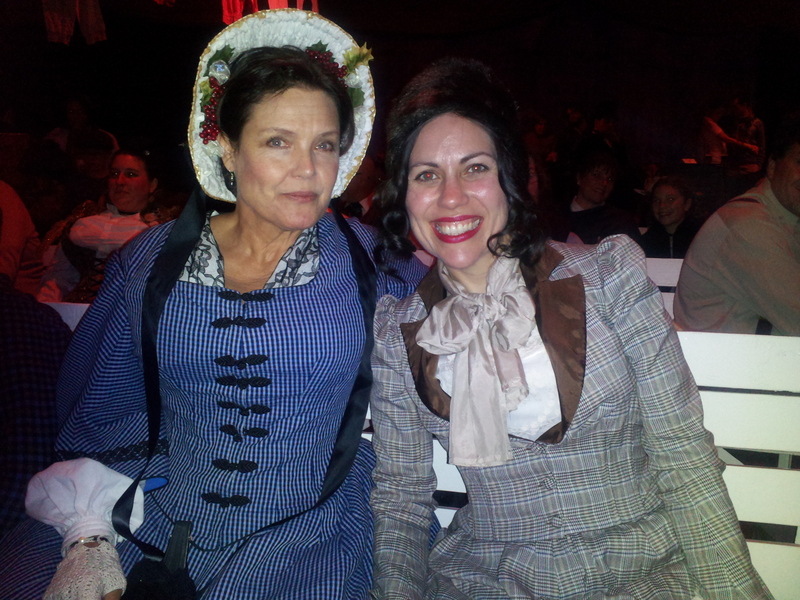 She was so nice and fun to talk to- we talked about so much costuming! They had shows we watched… and some we half participated in…though, to be honest, I kept looking at what everyone was wearing. At the very end of our trip, we went into a hat shop called Strawbenders. You can also see their work and get in touch with them via their FB page. Their hats are something else! Here I am wearing a poke bonnet- those were my favorites! So now that I walked around among hoop wearing people, I really want a hoop skirt! More specifically, I want to make a ball gown for the Steampunk Ball to be a hoop skirt! By the way, I’m helping out coordinating some of the events the weekend of the Ball and I have to point out the cool workshops being offered! I keep going back and forth on doing the hoop skirt because then I need different undergarments. We’ll see what I end up doing… will it bother me to wear 1880s garments all weekend and then have an 1860s ball gown for the ball? I know it’s a Steampunk ball so it shouldn’t bother me but I’m being silly…or maybe I’m just thinking of all the extra work of making or finding a hoop skirt. Even if I don’t do the hoop for February for the ball, I really want to make a hoop skirt for some event! I already have 12 yards of black poly satin for a gown. I just have to settle on a period! Do you ever stall on a project because you have too many options and too many likes? What fun! And the Steampunk Ball sounds like a blast! You need this book! I have a copy and sadly it seems to be out-of-print and way overpriced now, but maybe your library has it. If you know what style and year hoop you want, I can send you a copy of the appropriate crinoline pattern page. And the answer to your final question is YES! I do that all the time! I’m thinking I need to go back to this 2nd hand book shop in Santa Cruz and just get this book! I saw it and left it behind. I don’t know why I did it! The big reason why I don’t want to make my hoop skirt is because of the cost of the wires and channeling. There are cheaper ways to make one than to use the period “appropriate” supplies. The hardware store is a wonderful place! But I will admit that making hoop skirts is a bit of a pain and they can be bulky to store (even when collapsed). 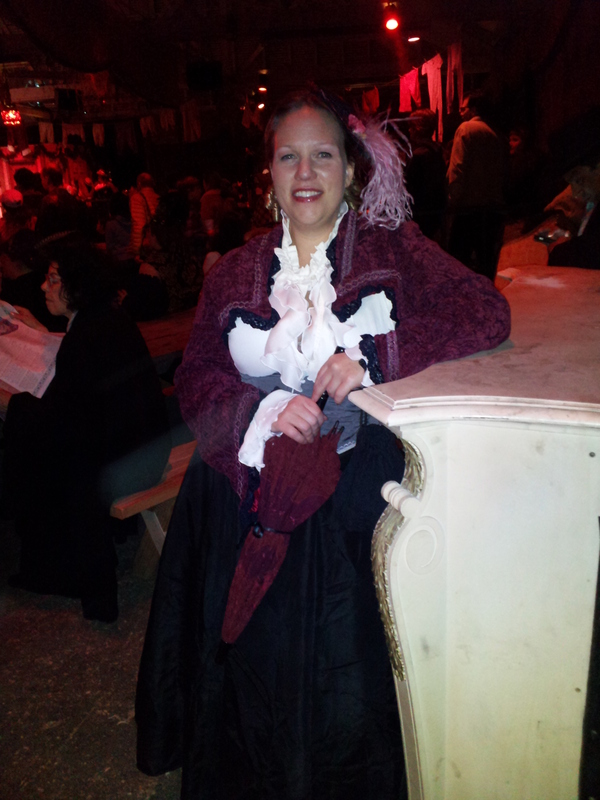 I am so jealous, I haven’t been to Dickens’ Fair since 2007. I made costumes for my daughter, her two stepdaughters and myself. I was planning on going this year, but only for one weekend but it didn’t work out. 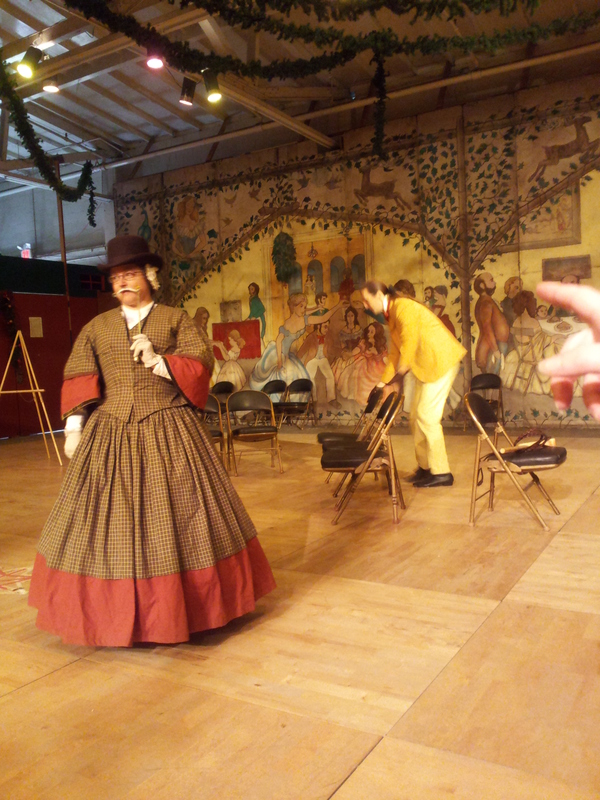 Dickens’ and RenFaire are the two things that I miss most from my life NOB. I started out as a costermonger (back when it was held on the pier) and before we moved, my friend Harry and I revived the Temperance Union. I got to wear classier clothes in the TU. If you do make hoops,you should cover them with another ruffled petticoat to eliminate the hoop lines. Victorians also wore another petticoat under their hoops to protect their modesty but that’s just trivia, not a costume suggestion. I have somewhere in my resources the formula for how wide to make a hoop in proportion to your height. I will look for it if you want. Split (open crotch) pantaloons are the best and amazingly discreet, but you probably already know that since you have a corset. If the universe doesn’t throw any more curves at me, I fully plan on going to Dickens’ in 2014 though only for the last weekend, because my HR2 treatment should be over by then. I have my fabric all picked out. It makes me happy that you are having so much fun in California!